7 – Fundraising Is Fun We raised nearly $1000 for children’s media research and advocacy in 24 hours. But we can do better. Download your copy of “Forever Young” on iTunes now! 6 – We Are Stardust Man, how lucky am I? A couple of emails and a handful of bona fide New York City’s rock stars show up: Casey Shea, Emily Easterly (her new single, “The Only Two On Earth” is amazing and available for free at her website), Jamie Leonhart, Bryan Dunn, Chris LoPresto, Jake Cohen and my oldest and dearest pals Chris Abad and Tony Maceli. Wow. What a stage! 5 – Casey Kicks It Up A Notch Even with it macabre verses (seriously, have you read the lyrics lately? ), “You Are My Sunshine” doesn’t rank very high on Lower East Side Hipness Meter. Nor do sing-a-longs. I thought perhaps I’d jumped the shark when I ditched strumming my guitar, tossed my hands in the air and began clapping. That is, until Casey Shea let loose a tell-tale, tequila-fueled, “Yeah!” and ignited the audience. For a minute there with Case, Emily, Bryan and me hollerin’ along with the audience, it was like a barn-burnin’ hootenanny. 4 – Golden Slumbers Just seconds before our silly, sloppy finale, Chris LoPresto, Casey and I gave the band a breather, and performed The Beatles’ “Golden Slumbers” on scarcely more than a wing, a prayer, and one, brief rehearsal (albeit a live one in front of kids). 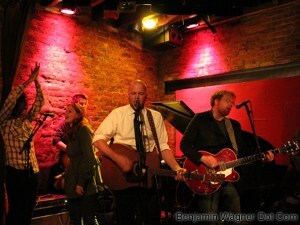 Rockwood was buzzing with Friday night chatter, all lung-busting banter and flirtatious hollering, still, we endured. And — surprise — a few notes in, the room fell silent and stayed silent through the last note of the last word: Lullabye. 3 – My Nephews Play Coy The truth is, “Forever Young” was preceded by the 2003 one-off, “Songs In The Key Of E,” a similarly-themed home recording for my nephew Ethan’s first Christmas. And so it was moving to have him there in the front row with his brother, Edward, sister, Ella, mom and dad. Ethan and Edward both watched intently, averting their eyes when I winked and smiled in their direction (then stormed the stage to bang on the drums just as soon as we were finished). Some day, I hope we get to perform with our band, Stinky Jack. Crazy nephews, indeed. Awesome, too. 2 – Six Years Later The story is well-worn, but awesome. I first met my now-wife in a shaft of white light at the end of the tiny Rockwood Music Hall bar. Five years later, we’re happily married. Better yet (as if it could get better), my beautiful wife was standing there with swaying with our beautiful daughter in her arms. Did I mention I was lucky? This post was almost as good as being there for those who missed out of the fun and the way you finished it was perfect with Maggie’s ah-hah moment of recognition at the end. You paint a lovely father daughter moment. She’s a lucky girl. Back to music, I’m loving your new CD and plan to write a review in a few days over at iTunes when I get a minute.